I just wanted to check in and let y'all know that the move is going just fine (so far). We've completed Phase 1 (acquiring and loading the truck) and Phase 2 will be tomorrow (wrapping things up here and driving all the stuff down to Louisville). Phase 3 (moving into the new apartment) will be happening Monday. Today was my last day of work. I'm going to miss that place like crazy (but I'm excited to start my new job the week after next). And since I'm checking in, I'll point out a couple of things I've been browsing lately. ETA (May 9): D'oh! How could I have forgotten to mention the auction?! I'll make it for that oversight by planting it here, front and center. 1. She got an agent for her young adult novel. 3. She found out she had Stage Four colon cancer. And what do you think members of the Kidlitosphere did when they found out about this situation? Well, they up and created an auction of fabulous items with proceeds going to help Bridget pay medical bills. What a wonderful and supportive community we blog in. So head on over there and check out the auction. I bid on (and was promptly outbid on) a few choice Babymouse items and new items are being added all the time. They've got everything from signed books and original artwork to manuscript critiques and publicity services. And with the proceeds going to such a great cause, how can you go wrong? ...it's the adults who need to get over themselves and read good books regardless of what shelf they're on at the bookstore, rather than making books of interest to teens harder for teens to find. Tricia of The YA YA YAs pointed me to this interview with Sarah Dessen in The Horn Book. Sarah's one of my favity-faves, so I loved reading her thoughts on writing for girls. Ever wanted to host a sleepover in your library? Stacy Dillon tells us how it's done. Have you been over to check out Booklights yet? This blog on the PBS site stars some of the Kidlitosphere's own: Pam from MotherReader, Susan from Wizards Wireless, and Jen from Jen Robinson's Book Page. 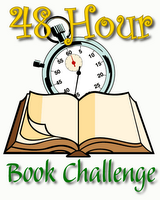 Speaking of MotherReader, have you signed up for the 48 Hour Book Challenge?! I was FINALLY able to do it last year and it was great, great fun. I'm totally doing it again this year even though my college roommate is being ordained that weekend. I'm not sure I'll be in the 20+ club (hours, that is), but I'll do what I can. The 48 HBC will be held June 5-7 and you can go on over to MotherReader's post to read the rules and sign up. And has everyone seen this Twilight cake on Cake Wrecks? Yeah, thought so. And on that note, I have a long day of packing up and driving (with two cats in the car... oy) tomorrow, so I'd better hit the sack. I'm not quite back from my hiatus, but rest assured I have some great posts* pending and I should be fully back some time next week. Thanks for sticking around! *Topics include the following: an Elephant and Piggie Party, an author interview with Linda Ashman, and a review of The Beef Princess of Practical County (among others!). Hope that the move goes well, Abby (that sounds like a long drive with 2 cats, but worth it in the end). Thanks for mentioning Booklights! It's nice to see it finally happening. I'm really looking forward to the 48hr BC this year, too.